SHISEIDO Firming Body Cream 200ml is a toning, firming and perfecting body cream, with a revitalising formula for all skin types. Created for those who'd like to fine tune their problem areas, this high performance cream promotes deep hydration and improved suppleness, resulting in firmer, plumper, more healthy-looking skin. Added aromachological benefits from the Japanese KUROHO fragrance blended with lotus ensure perfect calm. The rich texture of the SHISEIDO Firming Body Cream makes it ideal for massaging all over the body, ensuring microcirculation is boosted. An infusion of active ingredients, including Citrus Unshiu peel extract ensure maximum moisturising and refining effects, resulting in skin that is optimally hydrated with Hyaluronic Acid. Active Ingredients: Hyaluronic Acid, Orange Peel Extract. Firming and Toning Body Cream. Shiseido Essentials Firming Body Cream 200ml / 7 oz. 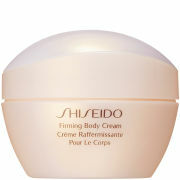 SHISEIDO Firming Body Cream 200ml was found on 4 websites and was price compared using EAN: 0768614102915. The cheapest SHISEIDO Firming Body Cream 200ml is shown as the main item, prices range from £32.75 to £50.00, excluding delivery. Price comparison based on price and delivery charges, with any valid discount codes being applied, is shown in the table above. Prices and information correct at the time of publication.